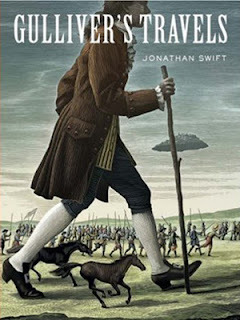 Swift is best known for his Gulliver’s Travels, the account of a multi-dimensional voyage into other realms, originally titled Travels into Several Remote Nations of the World. A less known work is A Tale of a Tub, which is the story of three sons - representing a trinity of Catholic, Protestant and Dissenter – who misread the text of their father’s last will (Bible) so as to in order to sabotage the original purpose of a coat (religion) left to them by their father (God). The story is repeatedly interrupted by the Hack, the alleged author of the story itself. Swift also coined the term Yahoo, which appears repeatedly in Gulliver’s Travels to indicate a degraded human being. "[b]ecause Men are never so serious, thoughtful, and intent, as when they are at Stool." Swift also wrote a large series of excremental poems, such as "Strephon and Chloe". O Strephon, e'er that fatal dayWhen Chloe stole your Heart away,Had you but through a Cranny spy'dOn House of Ease your future Bride,In all the Postures of her Face,Which Nature gives in such a Case;Distortions, Groanings, Strainings, Heavings:'Twere better you had lickt her Leavings,Than from Experience find too lateYour Goddess grown a filthy Mate. Oh! Caelia, Caelia, Caelia shits.